Finally – I’m getting to play with some of my pre-order goodies! I’ve had them for almost 2 weeks, but I’ve been strict with myself, saying that I MUST finish with Christmas projects, first! So here it is – a new stamp set sneak peek! This set has a beautiful watercolour painting look that I just love! I can’t draw or paint worth a darn on my own, so I’m very happy that Stampin’ Up! creates these sets. The stamp set is called Waterfront, and contains 16 stamps; 10 image and 6 words. Here is the stamp set, with one of the cards that I made. I decided to go with a tropical beach feel (note the palm trees!) with mountains in the background. If I had left out the palm trees, this could be a scene from here in my home town, Vancouver, B.C.! 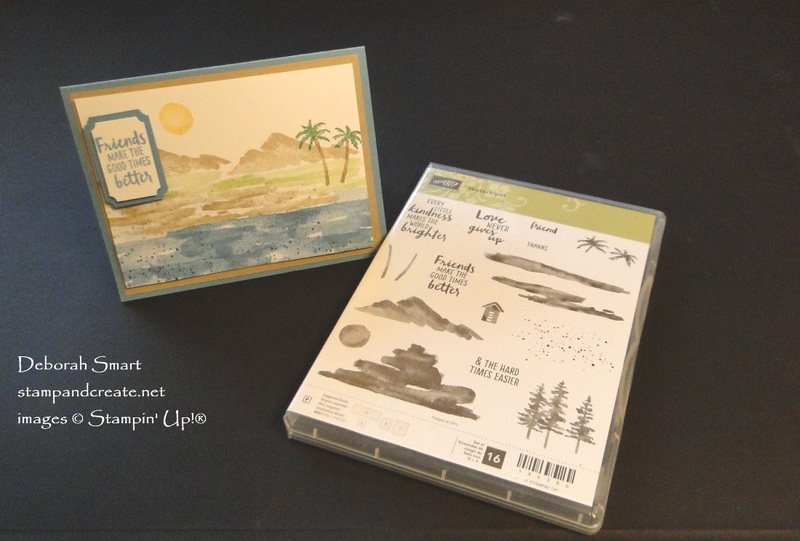 Using this Waterfront stamp set is really easy! You’re only limited by your own imagination, and the scene you want to create. This was my first play with the set, so I stayed pretty basic. Stamp the mountains in Soft Suede ink. I stamped it twice, slightly offsetting them so one is slightly in the foreground. Next, stamp the grass area in Pear Pizzazz ink. Note that you don’t have to use this image stamp as grass – that’s just what I decided to use it as! For the next step, I used the next larger image to create the sand area, stamping in Soft Suede ink. 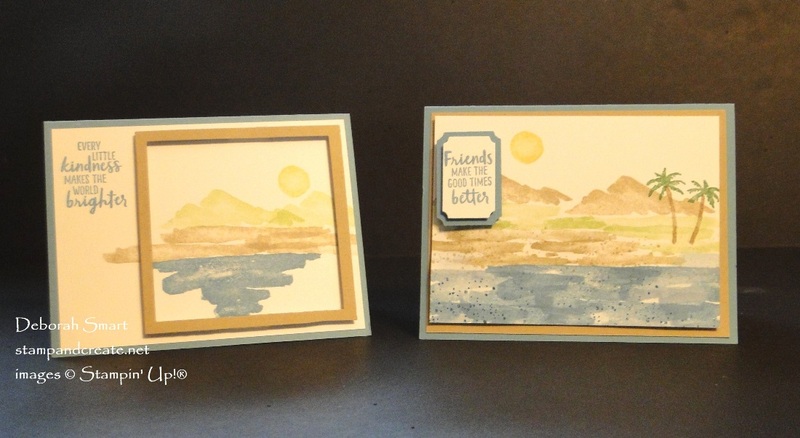 Finally, I used the largest image shape to create the water, stamping multiple times in Marina Mist ink. I decided to add a bit of texture, so I stamped the dotted image in Pacific Point ink over the water, and Soft Suede over the ‘sand’ area. Then, the palm trees are stamped in Garden Green for the tops, and Soft Suede for the trunks. Finally, the sun is stamped in So Saffron ink. To add the sentiment, stamp it in Marina Mist ink onto Whisper White cardstock. Use the retired Tags & Labels Framelits to die cut the sentiment, plus 1 size larger in Marina Mist cardstock. Layer them together with Stampin’ Dimensional, then attach to the image panel with more Dimensionals. 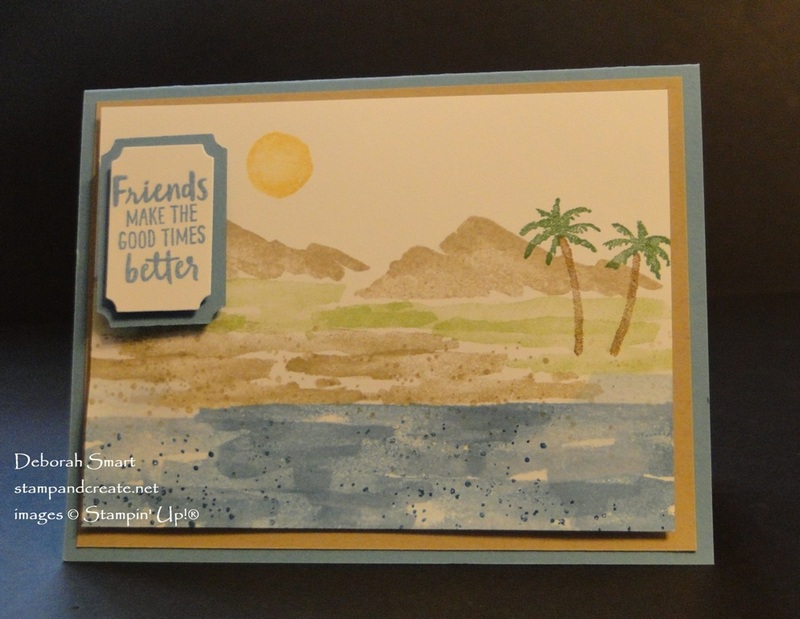 Put the card together by layering the stamped panel onto a layer of Crumb Cake cardstock, then attach it to a card base of Marina Mist cardstock. I couldn’t stop at just one card, so I created this one, too! This one on the left was fun! I used the same colours, but stamped to the right side of the panel, and left off the palm trees and ‘grass’ area. To give it a different look, I create a frame over the center of the image. Use the 2nd and 3rd largest of the Layering Squares Framelits, with the Big Shot and Crumb Cake cardstock to create the frame. Attach it with the Foam Adhesives Strips, to pop it up nicely. Add the sentiment on the left, in Marina Mist ink. The final look reminds me of a piece of art in a gallery, with the description plaque beside the art! This new stamp set will be available for you to order on January 3rd! Unless, of course, you decide that you can’t wait, and want to sign up as a demonstrator now! 🙂 All other products are used are available to order. Click on the product images below, or on my signature, to order through my online store. Just a note – Stampin’ Up! will be closed for Christmas and Boxing Day (Dec. 25th and 26th) so there will be no shipping during those days. Orders can still be made online during those days, though! If you don’t have a new Occasions and/or Sale-A-Bration catalogue, and are not a current customer of mine, please send me a quick email at debsmart@shaw.ca, and I’ll take care of that for you! I’m in Canada, so will only send out to Canadian addresses. Previous Previous post: Two Week Challenge! Next Next post: Wishing You A Very Merry Christmas! Beautiful! I love the beachy feel. This is one of my favorite sets ever! This is my favorite set in the catalog and you did an awesome job on those cards!